Welcome to issue 7 of liveartwork DVD, a unique publication showcasing contemporary live art. Issue 7 features an internationally diverse selection of contemporary performance art with artists from Quebec, China, Switzerland, Norway and the UK. The issue also focuses more on visually based work, although each piece is quite uniquely different from another. The DVD has a total running time of about 85 minutes. Scroll down to see more detials about the featured artists. To get a copy of liveartwork DVD issue 7 click on the 'order' link above. Les Fermières Obsédées is a performance collective founded in 2001 by Annie Baillargeon, Eugénie Cliche and Catherine Plaisance and based in Québec City. Their name, translated as “The Obsessed Farmers’ Wives” ironically alludes to traditional notions of women’s creative networks, such as the quilting bee. Their performances, often taking the form of tableaux vivants or public spectacles, satirize and confront pervasive cultural attachments to conformism, fashion, and mediatized images of femininity. They have performed in Québec, Canada, Ireland, Wales, Poland and Australia. Jordan McKenzie has exhibited both nationally and internationally developing his praxis within a variety of contexts. His work explores the relationship of drawing and the process of mark making to the body. New research is concerned with making critical and artistic investigations into the performativity of drawing. Mark making is explored as a process of mapping the body within space, a way of tracing its movements and plotting its absences. This work crosses the lines of performance, drawing, installation and sculpture seeking to explore notions of the undecidable, a point where the body and the mark (drawing) break through the terrain of traditional definition and establish new dialogues and relationships. 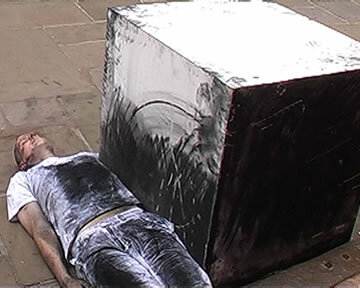 For this four hour performance Jordan McKenzie repeatedly graphited over the surface of a cube that corresponded to the dimensions of his arm. To keep something at arm’s length is to create a distance and a space of safety. 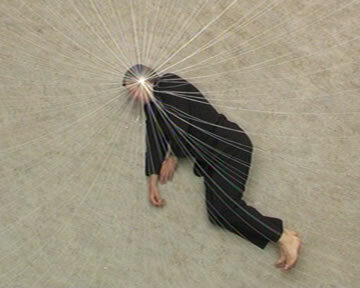 McKenzie's arm’s length does the opposite, inserting itself into the space that surrounds it, mapping and occupying the space in relation to his body rather than repelling it. At Arm’s length is a mapping of McKenzie's own body and the architecture that it occupies through and in the medium of drawing, It also an act of dialogue between artist and audience, asking both to consider the ways that we map and occupy physical, cultural and gendered space. The Norwegian artist Kurt Johannessen makes performances, artists books and installations. He has produced 150 different performances works presented at over 300 public performances throughout Europe since the early 80s. His performances often contain a poetic and minimalistic presence. Video 1: Three Days - I am burning sticks and making a long line of them. In the end it is like a drawing that is part of an exhibition. Video 2: First Encounter - I am painfully peeling feathers from a dead bird and putting them inside a transparent cone I am making small sounds as if I am talking to the dead bird. In the end I am breathing through the cone. Video 3: Nobe & Nobe 2 - These works are made for this special room. 180 thin white threads trail down into my ear. I lie like this for 20 minutes. In Nobe 2 there are small white marbles coming out of my mouth. Based in Basel, Switzerland, Pascale Grau studied an MA in Performance and Video at the University of Fine Arts in Hamburg. Since 1995 she has worked as an artist, teacher and curator in the areas of performance, video and installation. She has presented numerous performances in Switzerland and internationally, as well as presenting installations and videos in various national exhibitions. She teaches at various art schools throughout Switzerland and from 1998 to 2006 she was the co-organiser and curator of performance events at Kaskadenkondensator, an independent artist space in Basel. Interiors - The body is a house with different rooms, an exterior and an inner life. The belly of Pascale Grau is projected on a screen. She uses it as an open interior and furnishes it with objects from the toy box and the doll’s house. But soon the illusion is disturbed by the movements of the breathing belly, the little chairs and tables are staggering as if shaken by an earthquake. 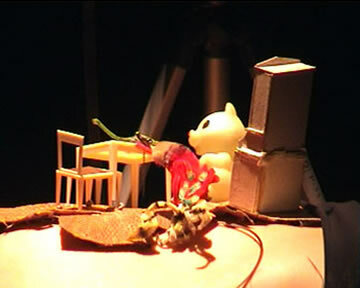 The scenes are filmed and then projected again, but now set to music created by Grau's own voice and a audio loop machine. Yu Ji was born in 1965 in Chengdu and graduated from the Sichuan Academy of Fine Arts where he obtained a bachelor degree. He currently lives in Beijing. In I am Caesar the artist wraps his naked body with toilet paper. In his hand he holds a wooden stick, symbolizing his power. His hand points in the distance. He stands perfectly still, only saying one sentence: "I am Caesar". The audience take the beverages that have been prepared before. They take a sip and spit it out on the artist. The toilet paper gets gradually soaked from the spitting and reveals the naked body of the artist. This is the end of the performance. He Chengyao lives in Beijing. She graduated from the Sichuan Fine Art University in 1989. She has presented recent work in the following venues: Busan Biennale, Korea; Asian Women's Art, Tokyo; Joshibi University Art Museum, Japan; The New Vision of Chinese Photography, Taibei Modern Art Museum, Taiwan; Cruel/Loving Bodies, Duolun Museum of Modern Art, Shanghai; 798 Space, Beijing; Art Centre Hongkong, China;14th Rencontre Internationale Art Performance Quebec, Le Lieu Centre Art Action, Quebec City and Clark Gallery Montreal, Canada; Panel discussion and Exhibition of Asian-Pacific Women Artists, Taipei Artist Village, Taiwan; China Live Art, toured to eight art centres in Britain; Reshaping Contemporary China Art, Millennium Art Museum, Beijing, China and University at Buffalo Art Galleries, New York, USA; Southeast Asia Performance Art Symposium and 7th Asiatopia Performance Art Festival, Queens Gallery, Tanland; Performance Art Documentations from China, SUMU Titanik Gallery, Finland; International Exhibitionist, Curzon Soho Cinema, London,UK; ”Vital” - International Chinese Live Art Festival, Chinese Arts Centre, Manchester, UK. ;“Starting from the Southwest”, Guangdong Museum, Guangzhou, China; “Global Feminist” ,Brooklyn Museum, New York, USA; “Chain”, CAC Manchester, UK; “Chinese Live Art Photography” ,Ying Gallery, Beijjng, China. 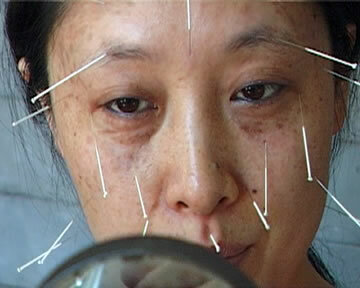 In 99 Needles, I took up ‘role-playing’ to re-enact the impression of my mother from my childhood memories. By using psychoanalytical ideas, this kind of ‘live-art’ practice is also a measure of the effectiveness of art in therapy and redemption; it is also made to investigate the temporal reaction on the body, in the past and presence. Performance Saga is a new series of DVD publications presenting video interviews with eight American and European women pioneers of Performance Art. The artists, now between 63 and 74 years old, played an important role in the 60s and 70s in establishing and developing this, at the time, new art form. In this dialogue between artists, the first women performers talk about their work and the conditions under which it arose, giving glimpses into how they think and position themselves. The first three DVDs in the Performance Saga series will be available by the end of October 2007. 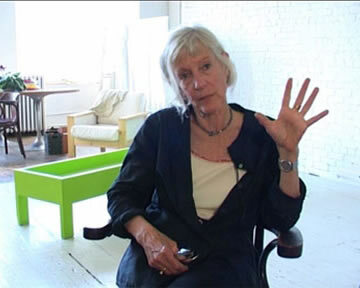 Performance Saga Interviews 05-08 with Joan Jonas, Alison Knowles, Ulrike Rosenbach, Martha Rosler and Carolee Schneemann will be published in 2008. Performance Saga is supported by Kunstkredit Basel-Stadt, Ernst Göhner Stiftung Zug, Luma Stiftung, Alfred Richterich Stiftung, Stadt Luzern - FUKA-Fonds, Kanton Luzern, UBS Kulturstiftung. © liveartwork 2006 - 2007. All Rights Reserved.